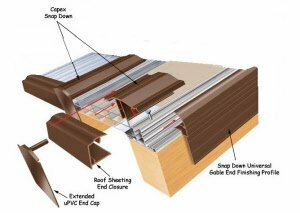 Polycarbonate roofing system suitable for fixing on top of timber roof joists. Bars are screwed on to the roof joist, then the polycarbonate sheeting is placed on to the bar. The sheets are then held by a plastic top cap which also hides the fixing screws. Roof projections up to 6m available. Timber supported roof kits. Suitable for conservatories, carports and canopies. Select a type of polycarbonate and colour you require. 2m roofs for canopies, patio canopy, porch canopies, bike sheds etc Price includes (Actual coverage 2.280 mm) 2x 1050mm Polycarbonate sheets x 2m long 3x 2m bars to fix to timber 1x 4m edge fillet 2x 1050mm sheet closures 1x 150mm fla.. Select type of polycarbonate and colour required. Price includes (Actual coverage 3.260 mm)3no 1050mm Polycarbonate sheets x 2m long 2x 4m bars to fix to timber cut to 2 m (includes 4 end caps) 1x 4m edge fillet 3x 1050mm sheet closures 1x 150mm flash band Anti dust tapes Installation Gui.. Select type of polycarbonate and colour required. Price includes (Actual coverage 4.310mm) 4no 1050mm Polycarbonate sheets x 2m long 5no x 2.5m bars to fix to timber 2no x 2m edge fillets 4no 1050mm sheet closures 1no x 150mm flash band Anti dust tape Installation Guide Step One Fix .. Select a type of polycarbonate and colour you require. Price includes (Actual coverage 5.370mm) 5x 1050mm Polycarbonate sheets x 2m long 6x 2m bars to fix to timber 2x 2m edge fillets 1x 150mm flash band 5x 1.050m sheet closures Anti dust tapes Installation Guide Step One Fix your fi.. Select a type of polycarbonate and colour you require. Price includes (Actual coverage 6.430 mm) 6x 1050mm Polycarbonate sheets x 2m long 7x 2m bars to fix to timber 2x 2m edge fillets 6x 1050mm sheet closures 1x 150mm flash band Anti-dust tapes Installation Guide Step One Fix your f.. Select a type of polycarbonate and colour you require. Price includes (Actual coverage 7.490 mm) 7x 1050mm Polycarbonate sheets x 2m long 8x 2m bars to fix to timber 2x 2m edge bars 7x 1050mm sheet closures 1x 150mm flash band Antidust tapes Installation Guide Step One Fix your first.. Select a type of polycarbonate and colour you require. Price includes (Actual coverage 8.550 mm) 8x 1050mm Polycarbonate sheets x 2m long 9x 2m bars to fix to timber 2x 2m edge bars 8x 1050mm sheet closures 1x 150mm flash band Antidust tapes Installation Guide Step One Fix your first.. Select a type of polycarbonate and colour you require. Price includes (Actual coverage 9.610 mm) 9x 1050mm Polycarbonate sheets x 2m long 9x 2m bars to fix to timber 2x 2m edge bars 9x 1050mm sheet closures 1x 150mm flash band Antidust tapes Installation Guide Step One Fix..